When was the last time you worked in the zone? I describe the zone as that sweet spot where you are concentrating and your thoughts are flowing freely to accomplish whatever it is that you need to accomplish. I was talking about this with a colleague the other day because we both said how much we enjoy working the week between Christmas and the New Year. The reason is simple – most everyone else is on holiday, which means not only is it quiet, but we are less likely to be interrupted. Fewer interruptions means I can work in the zone and, therefore, accomplish much. Unfortunately, Christmas comes but once a year so how do you get in the zone at other times? I’m fortunate because I have an office with a door. I only close it when I really need to get in the zone, but sometimes simply closing it partway will get me in the zone because I’m less distracted by people walking by. Colleagues with cubes use their ear buds to drown out noise and get in the zone. One friend, who is a freelancer, though, prefers the buzz of Panera Bread so she heads there with laptop and grabs some food and gets into her zone. The chatter from others is like white noise to her. Sometimes I trick myself and write in a different font. It changes the way I process. Other times, I use triggers. A venti cup of Starbucks on my desk is a sure sign that I want to be in the zone. I’m really looking forward to that last week of the year and spending time in the zone. How do you get in the zone? It’s that time of year when news outlets begin to compile the top news stories and dictionaries release their words of the year. As someone who always does the vocabulary quiz in Reader’s Digest, I’m always curious to see what words make the cut. 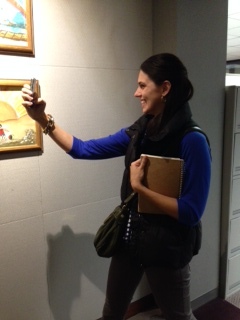 One of my colleagues is caught taking a selfie (Photo by Jenn Atkins). According to Oxford research, the use of the word selfie has increased by 17,000 percent since this time last year. Ironically, the word has not made it into the dictionary yet. Meanwhile Merriam-Webster announced its 2013 word of the year, which is science. Communicators might be intrigued to learn that communications came in at number four on the list. Part of it was due to the ongoing discussion about the NSA wiretapping program and what constitutes private communications, the site noted. The word also was looked up frequently by those who wanted to use it for resumes.